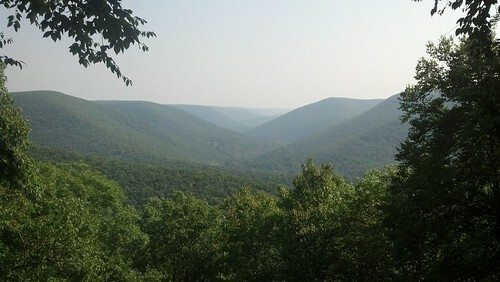 Many beautiful views are along the PA Wilds Trail. This one is over Slate Run on the Black Forest Trail. The PA Wilds is a best kept secret in the eastern U.S. 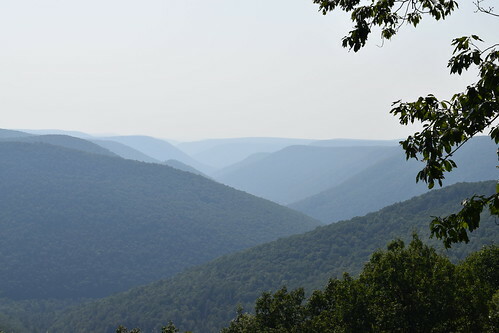 While crowds descend on the White Mountains, Adirondacks, Shenandoahs, and Great Smoky Mountains, you can have the isolated natural beauty of the PA Wilds all to yourself. Here, in an area as large as Vermont, are 29 state parks, over 2 million acres of public land, hundreds of miles of trails, and thousands of miles of rivers and streams. 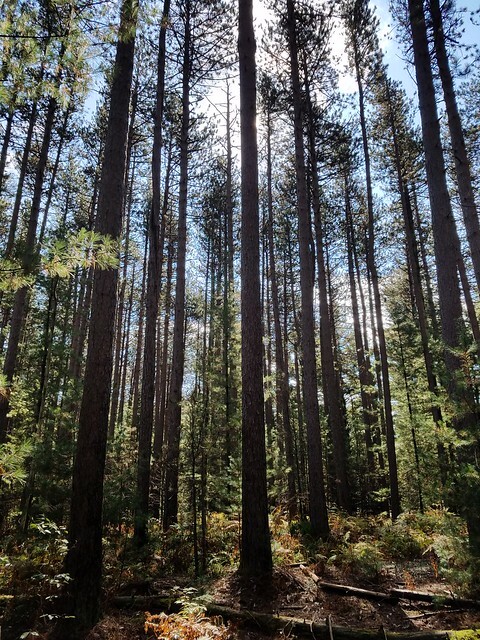 This area has some of the largest forests and darkest skies between New York and Chicago. 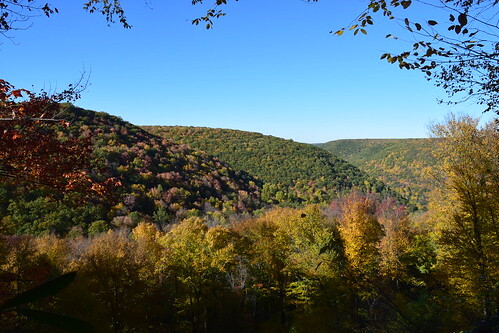 The PA Wilds covers a vast area of elevated, forested plateaus with countless canyons and gorges. There are waterfalls, vistas, giant rocks, old growth forests, wilderness, dark skies, and wild elk. Mountain laurel covers the higher elevations, as jungles of rhododendron grow along the streams. The PA Wilds offer incredible hiking opportunities, with the largest network of long distance backpacking trails of any place in the east. 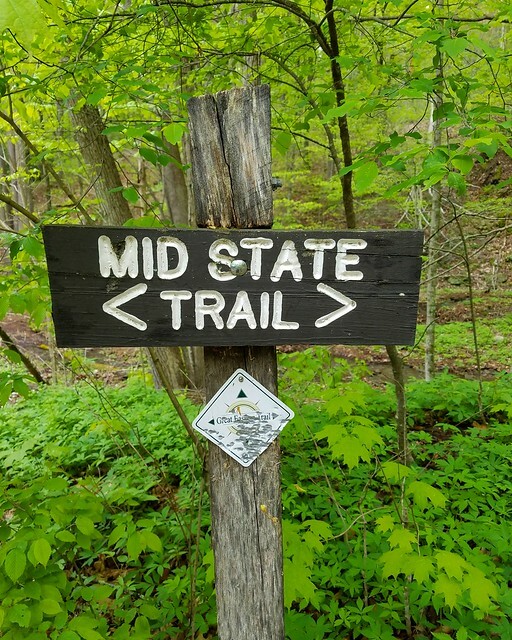 Amazingly, most of these trails link together, creating a continuous hiking route from Parker Dam State Park to the New York border near Cowanesque Lake. This remarkable hiking resource is unparalleled in the east. I’d like to propose the PA Wilds Trail (PAWT), a 171 mile route that crosses the PA Wilds along various trails. It is easily one of the most scenic and diverse hiking routes in the east. From west to east, it begins at Parker Dam State Park on the Quehanna Trail and ends on the Mid State Trail at Arnot Road, near the village of Arnot. The PAWT is not a trail in its own right, but rather a route that follows other existing trails, connecting them along a common thread. I have hiked most of the trails along the PAWT, but I have not thru-hiked it. From my experience, this is the most scenic and feasible route within the vast system of trails in the PA Wilds. Many of these trails are described in Backpacking Pennsylvania. Photos from along the trail route. Location of the PA Wilds Trail. Distance: A linear route of approximately 171 miles from Parker Dam State Park to Arnot Road on the Mid State Trail. All distances are approximate. 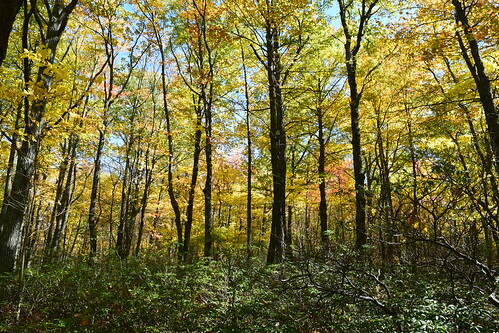 Blazes: State forest hiking trails (Quehanna, Donut Hole, Susquehannock, Black Forest, West Rim, and Mid State Trails) are blazed orange. Connecting and side trails along the PAWT are usually blazed yellow, but blue or red are also used. For the attached maps, only orange is used as that is the most common blaze color. Trail conditions: Variable. Some trails are well-established, others less so. The Donut Hole and Old Sinnemahoning Trails are some of the least established sections. This route does not require any off trail bushwhacking. Expect many stream crossings without bridges. Terrain: Moderate to very difficult. From Parker Dam, the route is moderate but builds in difficulty to the challenging Black Forest Trail section. Heading east from Blackwell, the terrain gradually becomes more moderate. Sections of the trail are steep and require ascents or descents exceeding 1,000 feet. Parking: Main trailheads and parking area are designated as “P1”, etc , on the maps. The trail crosses many roads with pull off parking. Highlights: Isolation, scenic streams, vistas, waterfalls, gorges, glens, canyons, meadows, wild elk, swimming holes, superb camping, historical ruins and remnants. Fall foliage is excellent and peaks in early to mid October. Mountain laurel is common along the trail and blooms in mid June. Rhododendron is common along some streams and blooms in early July. Issues: Parts of this route are rarely hiked and isolated. Some sections of the route will be brushy and less established; blazes may also be infrequent, particularly on the Donut Hole Trail section. There is a period of roadwalking near Antrim. Amenities: Parker Dam State Park has seasonal camping, showers, and snack bar. 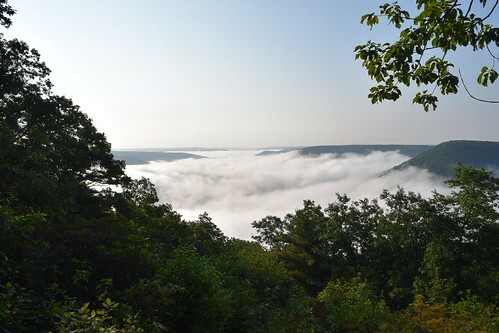 Kettle Creek State Park has seasonal camping and showers. There is one post office near the route, in Sinnemahoning, where there is also a restaurant. The route also goes through or near the villages of Slate Run and Blackwell where there are small stores or restaurants. The route goes through Antrim where there is a bar. Why hike this when I can hike more famous trails? No crowds, plentiful and available primitive camping, and remarkable diversity of scenery. The route is isolated, while introducing hikers to four rural communities. If you are looking for something different, this is the hike for you. Who maintains these trails? Mostly volunteers, along with the Bureau of Forestry. Please support the Keystone Trails Association, Mid State Trail Association, and Susquehannock Trail Club. Help maintain trails as you hike by clipping back brush, picking up litter, or clearing sticks and tree limbs from the trail. Choose your own adventure! 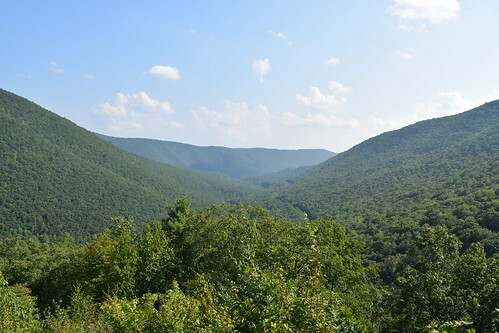 The PAWT is envisioned as a primary route through the PA Wilds that connects many other trails along which hikers and backpackers can choose alternate routes. The PAWT enables alternate adventures along the West Rim, Susquehannock, Donut Hole, Quehanna, Mid State Trails, and the Bucktail Path. It is even possible to connect to the Chuck Keiper Trail via the Garby Trail. These possibilities are unparalleled in the east, if not the entire nation. The future. 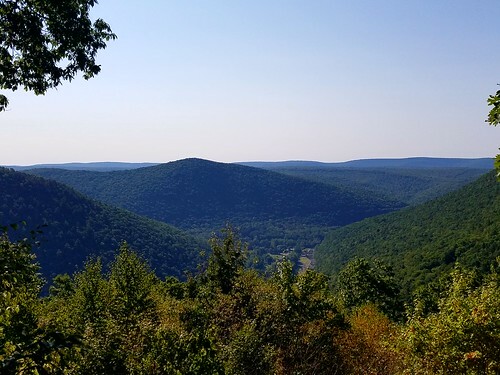 Hopefully the PAWT will become an established hiking route- a conduit to introduce hikers to the PA Wilds, its beauty, and vast trail network. Instead of hikers focusing on individual trail systems, the PAWT redefines what is possible and will spread hikers across the entire system of trails. The PAWT route will also be modified to ensure the most scenic and rewarding hike. Description: This section follows the orange blazed Quehanna Trail. It follows the southern section of this classic loop as it is more scenic than the corresponding northern section. 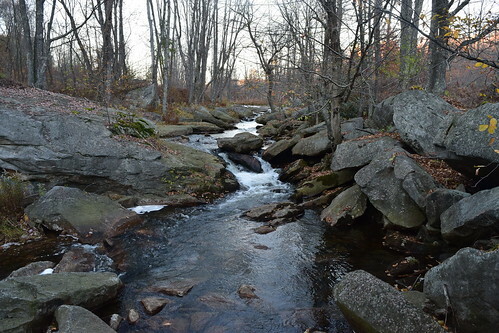 Hike old grades along scenic Laurel Run with rapids and pools. Hemlocks adorn the creek and there are some potential campsites. Cross some dirt forest roads and descend along Alex Branch with cascades, hemlocks, and camping. Expect wet areas. There are some nice views from meadows and drop to Trout Run with more cascades, boulders, and hemlocks. Hike up a beautiful stream valley dotted with boulders and cross the top of the plateau. 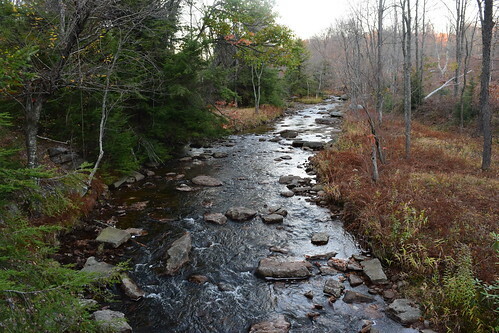 Descend along another stream with beaver meadows and climb gradually to Caledonia Pike. This section ends at Caledonia Pike. 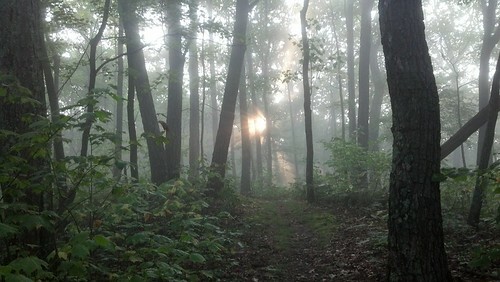 Description: This section follows the orange blazed Quehanna Trail, then follows a variety of yellow blazed side trails, to return to the northern section of the Quehanna Trail. With diverse scenery and great isolation, this section is a highlight of the route. From Caledonia Pike, descend to beautiful Gifford Run at an old log splash dam. Cross the run and follow downstream with rapids and boulders. Climb up a side stream to some rock outcrops and ledges with views that are largely grown over. Cross Merrill Road and the top of the plateau with hardwood forests. Reach the yellow blazed East Cross Connector (ECC) at Lost Run Road, on which you will turn left, leaving the Quehanna Trail. Follow the road a short distance and then turn right, descending along a small stream and then above Mosquito Creek. Return to Lost Run Road and cross Mosquito Creek on the road bridge. Hike up the road and follow the ECC to the left. Descend to Meeker Run with cascades. Good camping can be found further up the ECC. Turn left onto the Crawford Vista Extension, which leads to a beautiful vista over the Mosquito Creek Gorge. This is a great view for sunsets. Continue on the Crawford Vista Trail. Cross some meadows and a wet area. Descend along boulders to Mosquito Creek and a footbridge. There is camping here. Turn right onto the beautiful Bridge Trail. 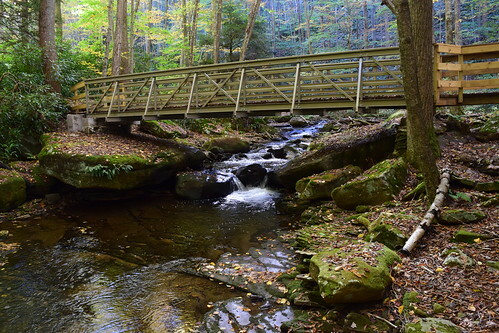 The Bridge Trail follows Mosquito Creek with its rapids and boulders, and then crosses vast fern meadows that are reminiscent of Dolly Sods. Look across the stream valley with large white boulders. Return to the ECC and turn left on it. Crossing more meadows along Beaver Run. 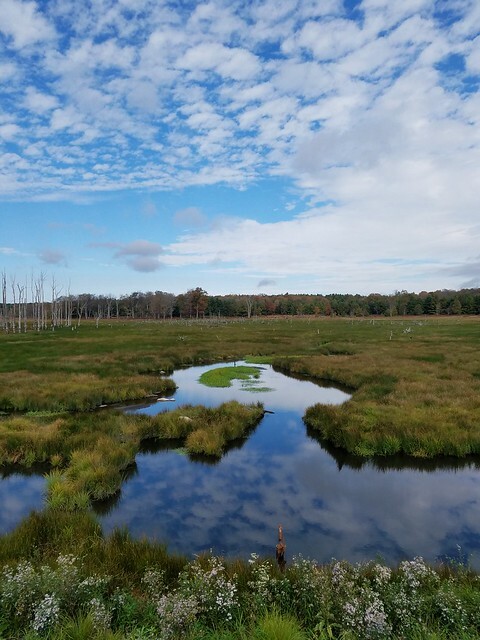 Reach a large, beautiful pond, known as the Beaver Run Shallow Water Impoundment. Hike the ECC around it and then turn right onto the Marion Brooks Loop, also watch for signs for the Lincoln Trail. This section features beautiful pine and spruce forests. Follow the Lincoln Trail to P2. Follow a grade to the east, this may be known as the Lincoln or Teaberry Trails. Cross the Quehanna Highway and another small meadow. Reach a nice vista from a cliff looking over Paige and Red Runs. Descend to Paige Run, a gorgeous place with giant moss covered boulders, cascades, and hemlocks. Ascend to more ledges with nice views. Return to the ECC at Roaring Run, on which you turn right. Follow the ECC to the Quehanna Trail and turn right. Descend Porcupine Draft with cascades and then follow Red Run Road. Leave the road, cross Red Run on a bridge and reach a beautiful section of boulders, cascades, pools, and thick rhododendrons. 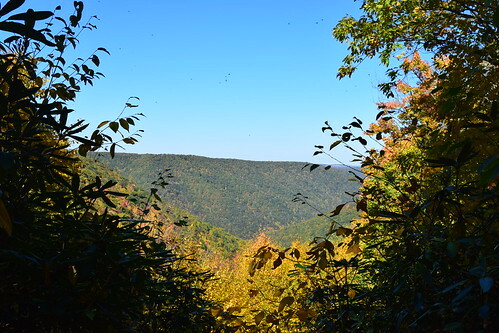 Hike along beautiful Sanders Draft and climb to the plateau with more meadows and hardwoods. Reach Arch Spring and a narrow view of Little Fork Drafts deep gorge. Reach Hoover Road, where this section ends. 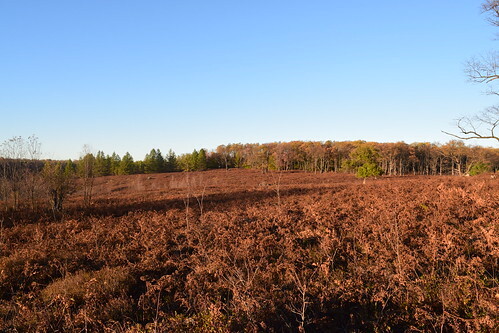 Description: Continue to follow the orange Quehanna Trail and cross some pipeline swaths, ideal places to see wild elk herds. Cross some small meadows and reach the top of Laurel Draft where there is a campsite. Descend scenic Laurel Draft. The trail stays well above the creek, but you can see the boulders and cascades in this beautiful gorge. Cross Wykoff Run Road and reach P3. Cross Wykoff Run over a bridge and begin a climb up scenic Upper Pine Draft with small cascades. 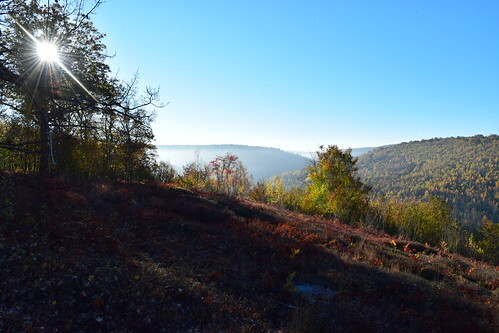 At the top, pass some meadows and reach the yellow Old Sinnemahoning Trail (OST). Leave the Quehanna Trail and turn left. Follow the OST, which is an old road, across the top of the plateau. Expect the trail to be not very well established and to see blowdowns. Hardwoods predominate along the trail. Descend to Jerry Run Road. Turn left and walk to Wykoff Run Road, where this section ends. Amenities: Post office in Sinnemahoning, about a mile off the PAWT. Willows Restaurant is on the PAWT, where Wykoff Run Road meets PA 120. Seasonal campground and showers at Kettle Creek State Park. Description: Follow Wykoff Run Road, pass P5 and cross the large Sinnemahoning Creek. Willows Restaurant is just ahead and features good food at fair prices. 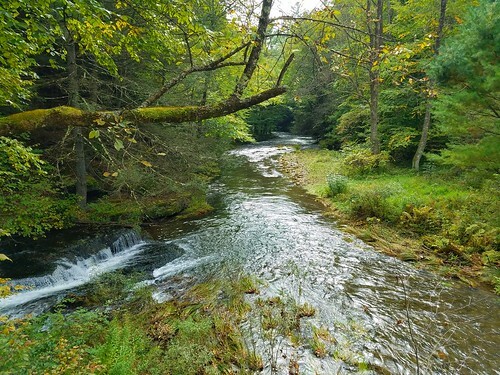 Enjoy the surroundings, Sinnemahoning is beautiful with the giant creeks, towering plateaus, and railroad bridges. Appalachia at its best. Follow PA 120 East, pass PA 872 and cross a bridge over the First Fork Sinnemahoning Creek. Reach the non-existent village of Jericho and make a left on a road; notice the orange blazes. This is the start of the Donut Hole Trail (DHT), which the PAWT will follow to the T Squared Trail. The DHT is a lonely trail and is one of the least hiked sections of the PAWT. Hopefully, the PAWT will bring more footsteps to it. The DHT is not well established and can be overgrown in places. Follow the road and then hike up Ellicott Run, a steady climb of 1,000 vertical feet. Cross the top of the plateau, reach a pipeline swath and then Montour Road; follow the road for about a mile. Descend into a stream valley with a small creek and climb gradually back to the rolling plateau. Descend along another small stream to scenic Cooks Run. 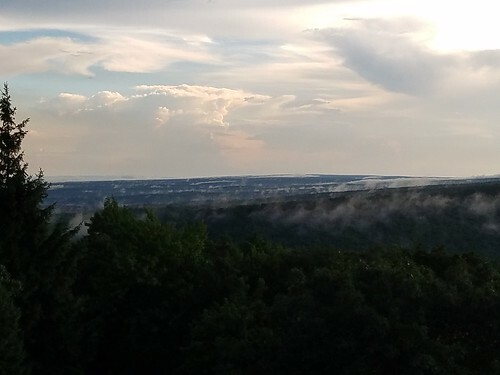 Hike up Cooks Run with some possible camping and climb to Crowley Road with a view. The DHT then reaches a highlight, Kettle Creek Vista, a stunning view over Kettle Creek Reservoir and the foothills to the north. Truly beautiful. Descend along a small stream into a gorge with rhododendrons. The Alice Trail joins from the left; this is a high water bypass in case Kettle Creek is too high. Hike along Kettle Creek and then cross it below a low dam built by the CCC at the Lower Campground. This is a significant water crossing; do not attempt in high water. Reach the Lower Campground with seasonal showers and water. The DHT crosses through the campground, crosses Kettle Creek Road and a parking area, and begins to climb up along Summerson Run and its narrow gorge with pine trees. The trail is rolling for a few miles across the top of the plateau. Descend and climb, in and out, of the Right and Left Forks of Hevner Run. 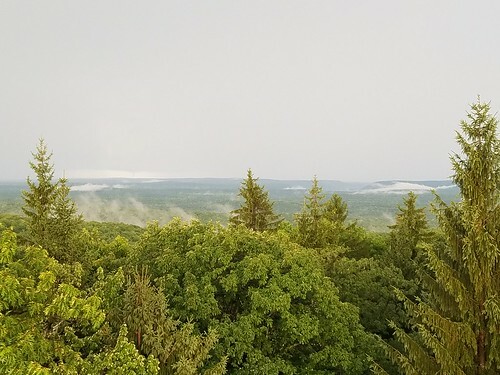 Climb along the DHT up to the Tamarack Fire Tower, one of the few you can climb in the state, with excellent vistas. Descend to PA 144 and cross Drury Run. The DHT heads north along rolling terrain and small streams. Follow a pipeline swath and descend to Hensel Fork Road. Cross the road and climb over a low ridge to Sandy Run Road and its spruce forests. Leave the road and hike up scenic McNerney Run valley. Reach Pfoutz Valley Road and turn right (a beaver pond is just to the left, a little off trail). Follow the road for about a half mile. Parking: No significant trailhead parking. Pull off parking possible at road crossings. 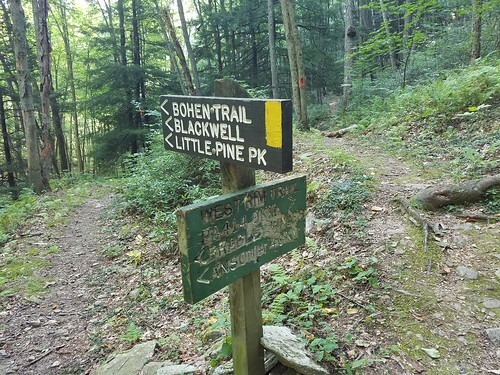 Description: This section follows the orange blazed DHT, which also follows the same route as the Susquehannock Trail (STS) for several miles, and then the yellow blazed T Squared Trail, to end at the famous Black Forest Trail (BFT). From Pfoutz Valley Road, the DHT becomes more challenging with steeper climbs in and out of valleys and gorges. Descend Merriman Hollow and hike up along Shingle Branch. Descend to Greenlick Run and continue the pattern of hiking up and down steep stream drainages. Stinging nettle also becomes an issue in summer. Cross Young Woman Creek Road and hike up Sevenmile Road. Cross the level plateau and descend to Cougar Run. Here, leave the DHT and turn left onto the T Squared Trail, where there is a steep, short climb. The T Squared Trail then follows level and rolling terrain across the plateau through scenic forests and mountain laurel. It is regarded as an enjoyable trail. Make another descent to Baldwin Branch and the BFT, where this section ends. The BFT is blazed orange and the PAWT route turns right onto it. Amenities: Hotel Manor, a restaurant, and a small store at Slate Run. Description: The BFT section of the PAWT is a highlight and the most rugged part of the route. 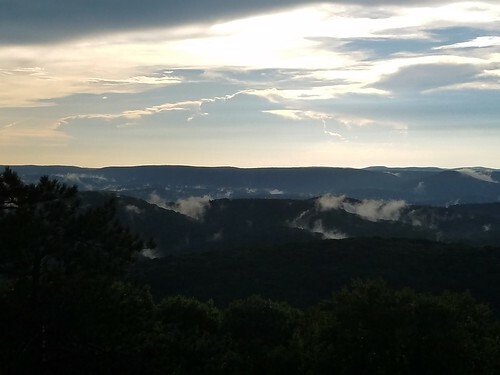 Here you will find steep, challenging climbs of over 1,000 vertical feet, cascades, superb camping, and numerous stunning vistas overlooking the Pine Creek Gorge. From the T Squared Trail, follow the BFT and climb to PA 44 and a parking area (P5 on the map). Rolling terrain follows to a view. 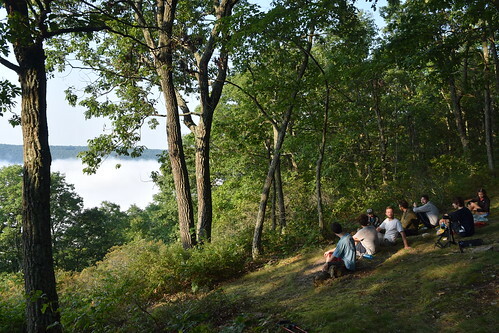 A steep descent into Callahan Run features a gorge, falls, and campsite. Hike up the creek, turn right onto a ridge to Hemlock Mountain with three excellent views. An extremely steep descent follows the Naval Run with camping. Follow a grade above the scenic stream and cross the creek above a falls. Another steep ascent follows to a ridge with more excellent views. 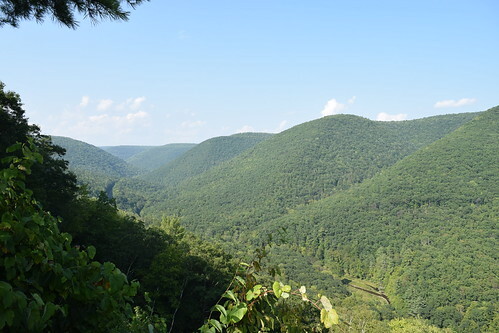 There is a steep descent to Little Slate Run with more great campsites. 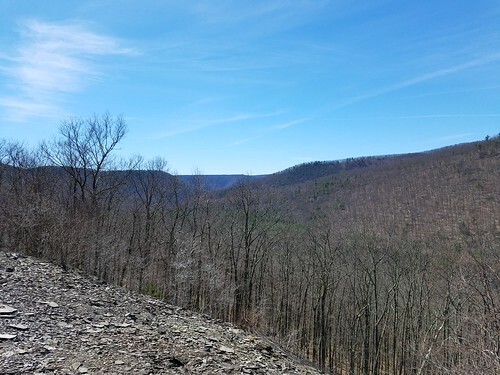 Climb to the plateau, drop into Foster Hollow, pass a small pond, climb the plateau and then descend steeply into Slate Run with more phenomenal views. 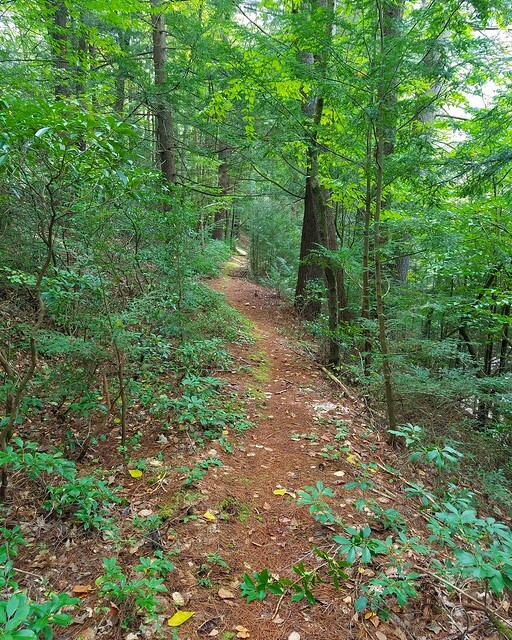 A nice, easy trail brings hikes to Slate Run Road and a restaurant, the Hotel Manor. The BFT passes behind the restaurant and crosses a footbridge over Slate Run. A more gradual climb follows up a ridge to excellent views and old quarries with cliffs and unique sculptures people have made with the flagstone. Reach the top of the plateau with laurel and rolling terrain. Drop into a small valley with a good spring. Reach the juncture with the Algerine/Long Branch Trail, which is blazed red; you may also see yellow or blue blazes. Leave the BFT and continue straight on this trail. 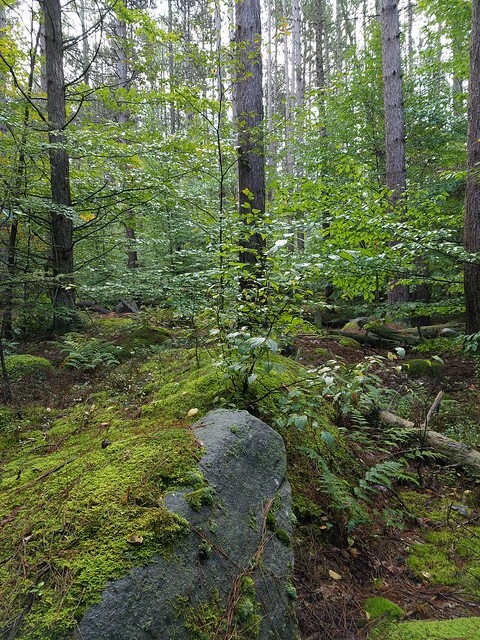 This is a great trail with scenic forests of pine, laurel, and some spruce. This section ends at Gamble Run Road. Amenities: Small store in Blackwell, may be open seasonally. 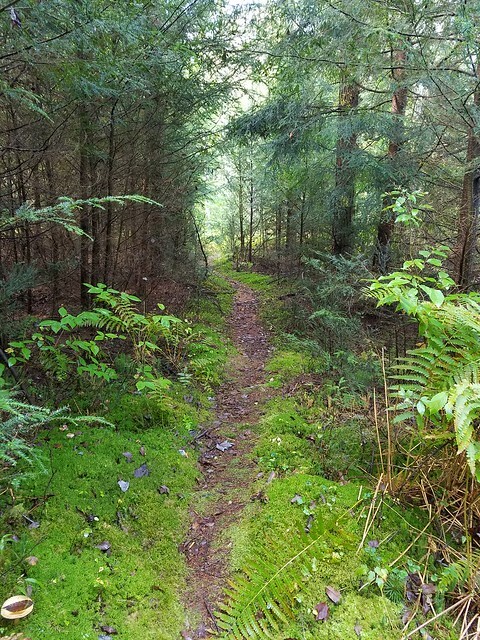 Description: The Long Branch Trail (LBT) is a beautiful trail that helps make the PAWT such a special hiking route. Cross the top of the plateau through beautiful forests and then make a descent along a small stream with cascades and small waterfalls. Cross beautiful Cedar Run with slides and swimming holes and walk a short distance up the road (below is a beautiful gorge, cascades, and deep pools). Follow the trail through beautiful forests and climb up scenic Long Branch with more cascades. The trail levels at the top and reaches the orange blazed West Rim Trail (WRT), on which you will turn left. 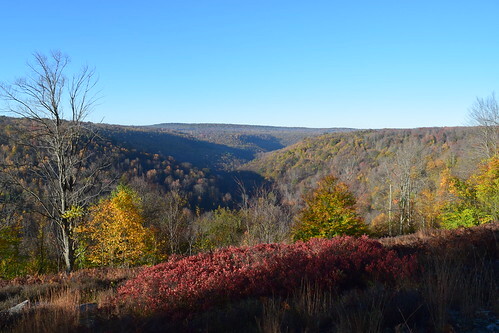 The WRT is a popular trail, and for good reason, it explores the west rim of the PA Grand Canyon, otherwise known as the Pine Creek Gorge. The WRT explores beautiful pine forests and features a fine view over Blackwell. Reach Bohen Run and turn right off the WRT, and follow the yellow Bohen Run Trail. This trail descends above Bohen Run and the beautiful Bohen Run Falls. (At the time of this writing, there are reports that the Bohen Run Trail has been impacted by a landslide). A side trail descends to Pine Creek and some excellent campsites. 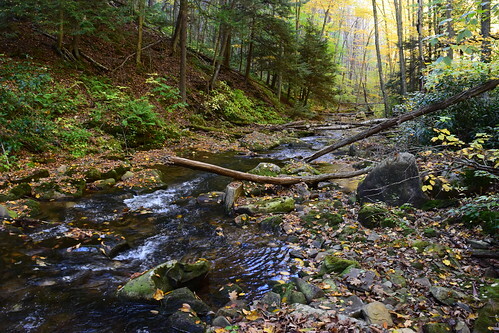 The Bohen Run Trail curves into Jerry Run’s glen and passes above another falls. Descend to Blackwell and the parking area (P7) along Pine Creek. Parking: P7 and P8 on map. 41.682660, -77.153075 (P8). Description: The rest of the PAWT follows the orange blazed Mid State Trail (MST), the longest in the state. It stretches from Maryland to New York. This section is remarkable for its scenic and historic diversity. It also has the longest roadwalk on the PAWT. This last section features vistas, waterfalls, incredible swimming holes, large rocks, superb camping, and historic ruins. In Blackwell, hike on PA 414 to the Pine Creek bike trail and follow the MST’s orange blazes to the left. Follow the bike trail for over a mile and then turn right and climb up along Stone Quarry Run. At the top, the MST meanders along the east rim of the gorge, passing a side trail that leads to fine views. The MST explores scenic woodlands, passes a good spring, and features a lot of laurel. Cross Claymine Road near a small parking area and explore large rocks. Descend along Mossy Run, a small stream with many waterfalls. Reach Stony Fork, a highlight, with its bedrock rapids and deep pools. This is a stream of great beauty. It features incredible swimming holes and bedrock grottos. The MST crosses this sizeable stream without a bridge, do not attempt in high water. Climb along Roland Run, where nettle is an issue in summer, and enter beautiful hemlock and pine forests. Reach the end of Tannery Hill Road. Descend into a glen of a small stream, but the MST maintains its elevation and passes the unique stone ruins of an incline plane, used to transport coal from the top of the mountain to the bottom. Cross Rattler Road, some small streams and ledges. Reach a unique rock area with deep crevices and chasms, watch your step. Next is the Haunted Vista from the old Anna S. Mine; the vista is from an old culm pile and is quite beautiful. Pick up a road, the start of a six mile roadwalk, and descend to PA 287. The MST follows Sand Run Road and climbs to the small village of Antrim. Turn left onto Main Street; the Duncan Tavern is a block to the right. Main Street is SR 3009 and becomes a rural road, but with truck traffic. After about four miles, the MST leaves the road and enters the forest to the right. Here, the trail crosses private property so please stay on the trail, do not camp, or loiter. 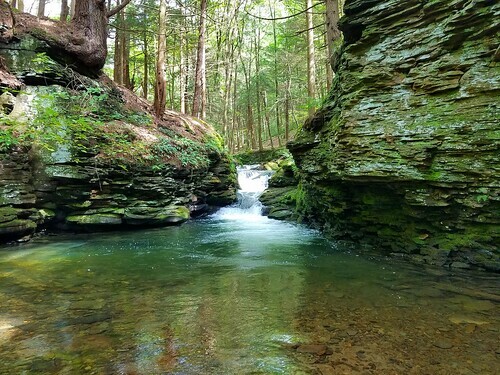 After rolling terrain, reach the Tioga State Forest and gorgeous Nickel Run, a side trail drops down to 30 foot Nickel Run Falls, a swimming hole, and campsite. 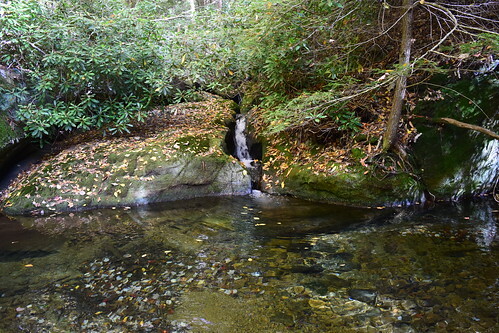 The MST offers beautiful scenery above Babb Creek with hemlocks, moss, springs and small streams. Cross Babb Creek in a stunning spot where a couple of grottos meet with cascades and rapids. Reach Sand Run Falls, about 20 feet tall, in a beautiful gorge with excellent camping. The MST follows Sand Run through scenic forests and reaches the parking area at P8, the eastern terminus of the PAWT at Arnot Road. 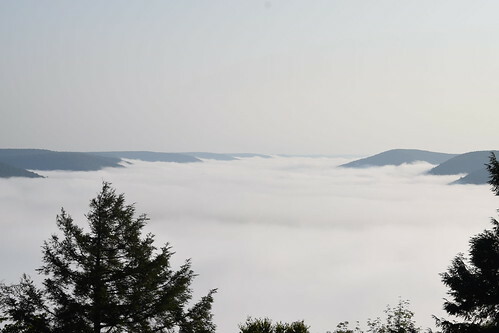 The MST continues north to Hills Creek State Park, Hammond Lake, and Cowanesque Lake. It features more roadwalks and private property that is closed during hunting season, so the PAWT ends at Arnot Road. However, the rest of the MST is beautiful with the large lakes and excellent pastoral vistas. 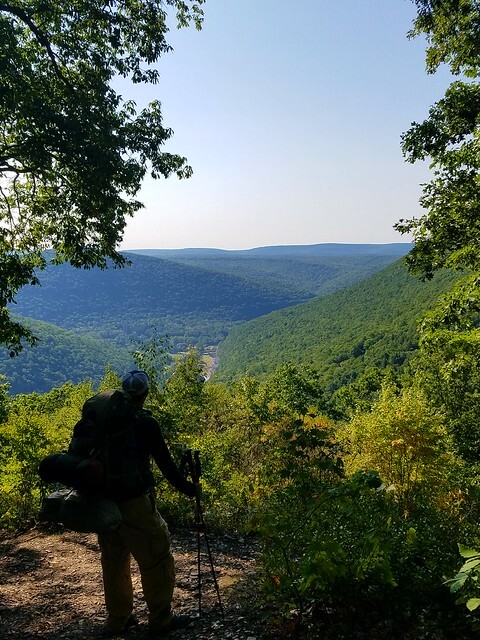 This entry was posted in Uncategorized and tagged Backpacking, black forest, donut hole, Hiking, mid state, pa wilds, pennsylvania, quehanna, trail, west rim by endlessmountains. Bookmark the permalink. A modest proposal from a guy who would know. I hope this happens! This is really very interesting. Thanks.